Fits 1980-85 Small Block Chevy with right hand dipstick into 1962-67 Chevy II. Windage tray install kit 697-81150. 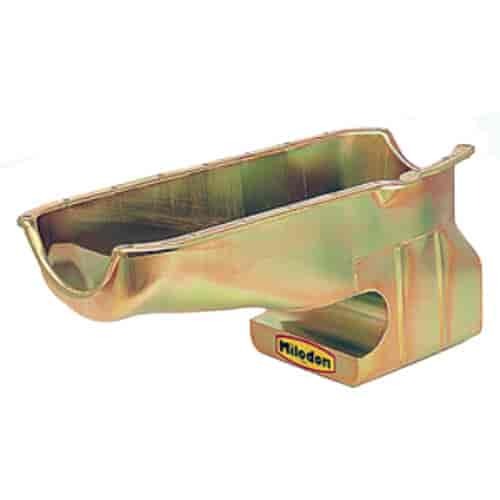 Milodon Street/Strip Oil Pans are designed to provide maximum performance for your application. These well engineered oil pans release additional horsepower, increase engine life and oil control. Deep sumps provide ample oil supply and low profiles provide maximum ground clearance (clears stock chassis, steering, and most headers as listed). Street/Strip Oil Pans are a necessity where high-volume oil pumps and increased RPM ranges are used. Low-profile "triangulated" sump design gives both adequate ground clearance and sufficient oil capacity for any high-performance use. This pan is equally suited for use on the street or strip. Oil control baffles 100% subdue oil movement and provide increased horsepower. High-horsepower output design, front of the oil pan is deeper to allow the use of a full-length competition-style tray (Tray is attached in the pan by quick-release fasteners to allow easy removal). The pan fits stock crossmembers without modification, as well as stock starters and oil filters. Appearing stock on the outside, contains sufficient horizontal baffling to 100% control oil movement. Pan mounted windage tray provides increased power yet requires no mounting to the block. A complete low-cost performance package with magnetic drain plug. Does Milodon 31061 fit your vehicle?